Joyce Silverstone is a graduate of the School of the Museum of Fine Arts Boston, where she was awarded a Traveling Scholarship to continue her study in London and Paris as part of the SMFA 5th Year Program. Before moving to Western Massachusetts her at life was centered in NYC where she worked at the Bob Blackburn Printmaking Workshop. She is a Massachusetts Artist Fellowships recipient in both painting and video. She has been exploring and refining ways of combining printmaking and painting for over 30 years. She is a certified Rosen Method Bodywork Practitioner and Teacher, and teaches creative process to students of meditation and embodied awareness. Her work is represented in corporate, private and public collections including MIT Museum, De Cordova Museum, Boston Public Library, Yale University Gallery of Art, Portland Museum of Art, Smith Art Museum, and the Hood Art Museum at Dartmouth College. Recent exhibitions include Central Booking Gallery (NYC, NY), A.P.E. Gallery (Northampton, MA), San Alejandro Academy of Fine Arts (Havana, Cuba), Bromfield Gallery (Boston, MA), Lorg Fine Art Printmakers, (Galway, Ireland). 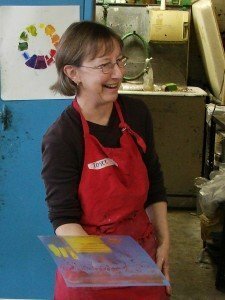 As a core faculty member at Zea Mays Printmaking, Joyce is dedicated to using and teaching sustainable and less toxic printmaking practices. She teaches and demonstrates printmaking at art centers nationally, and was selected to be an Akua Ink Demonstration Artist in 2014. “I especially like sharing new methods of printmaking and seeing how they can help artists “break through a barrier” or come into a new relationship with their work. Additionally, my experience as a teacher and practitioner of Rosen Method Bodywork, calls on me to practice awareness, attention and presence when teaching a creative process. I bring this aspect of my experience to my art making and art teaching, to dwell in the process long enough to give meaning to the materials. I enjoy fostering an atmosphere where students can feel confident developing their personal imagery.